We have just expanded our our 16th century house in the heart of the gorgeous old town of Antibes. We purchased a small house next door and can now offer three bedrooms, two bathrooms and a small outside roof terrace. We have added air-conditioning too. The house can sleep 6 in beds, two on a really good sofa bed and, at a push, another 2 on self-inflating air mattresses, although 10 in the house is a squash. The house is in the Rue Brulee, just off the Rue des Bains near the top of the old Marche Provencale. We now have a secure parking space in an underground car park about 400 metres from the house on the edge of the old town which guests can use for no extra charge- a real benefit in Antibes! Students at Skema university are welcome for winter lets, as we have done successfully in the past - references available. 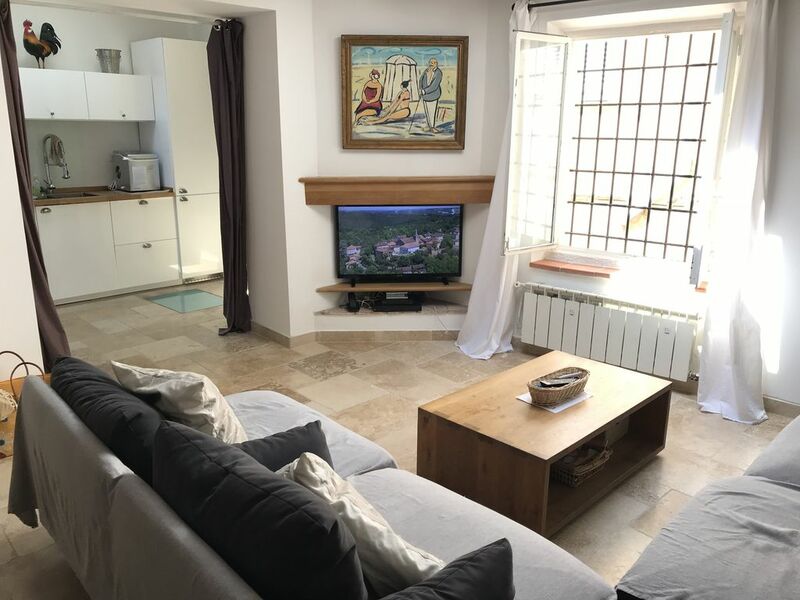 The house is minutes from beaches, cafes, restaurants, market, shops, the Picasso museum and the yachting marina yet is in a very quiet pedestrian street. It is also close to museums and the rampart wall of the old town which looks straight on to the sea. The house is on three floors with the middle one providing the main living room and kitchen, the upper one a bedroom and bathroom and the lower one a large vaulted-arched bedroom with bathroom which can accommodate several children. The property has all mod-cons such as TV, HI-FI, fridge/freezer and dishwasher. Antibes is an exceptionally pretty place and has all the attractions of a historic old town such as a huge choice of cafes, restaurants and shops around the numerous pretty squares. It also offers the famous Picasso Museum, the cathedral, the Provencal market and the yachting marina. PARKING is not easy in the old town and you can have a great holiday without a car or just rent one from the usual companies in the new town (Blvd Albert 1). We now have a parking space in the new underground car park by the port, a five minute walk from the house which guests are welcome to use for no extra charge. Everything from beaches to sailing clubs to boat hire is right on your doorstep and transport links to Cannes, Nice, Monaco and Juan Les Pins are excellent, either by local bus or train. There is no need to have a car although car hire locations are close by. Antibes is about 10 miles from Nice International Airport and is reachable either by taxi or bus. The bus is now only €1 per person from the airport! The Alps are only about 90 minutes away for mountain walking and the hills of Provence are even closer. Large sofa, TV with French and some US/UK channels, small wifi hifi. There are a few books left by guests, in English and in French. Feel free to leave books you have finished and help yourselves to the ones on the shelves. New for 2017 - small outside terrace with dining table and chairs. There is also a high chair and travel cot. The property now has air conditioning for those hot August nights. We have ceiling and other fans for the hottest weeks of August but the house has thick walls and the Rue Brulee is a shaded street so the house does not get too hot. I chose this house because I planned to write and wanted to be near the market and the sea. The house embodied all of these wishes and more. The market was amazing; the produce was fresh and full of flavor. The kitchen was new and very user friendly. The beds were comfortable, the amenities carefully provided. The owners and manager could not have been more welcoming and helpful. I look forward to staying in this house in the future. Great for a family, but also very comfortable for a single writer. Thank you. This beautiful old townhouse has been lovingly restored and sympathetically modernised with very welcome air conditioning and three bedrooms, all en suite. The open plan living area includes an enclosed terrace which, whilst having no view, was perfect for an active toddler who loved running around on it. We were three generations - grandparents, parents and baby - holidaying all together for a week. Not only was the house great for all our needs, it is also perfectly situated within easy walking distance of shops, restaurants, market, beaches, not to mention the railway and bus stations. We used public transport for all our outings - very cheap and utterly reliable. We were there for the 14 July and were able to watch the commemoration ceremony from Nice for the 85 people killed there in 2016. It was very moving and it felt great to be on the spot and pick up the emotion in the air. There is a fabulous bakery within a few steps of the house and the famous Marche Provençal is just round the corner. We would thoroughly recommend this house. We have stayed in Antibes many times but this is the only property to which we would consider returning and we definitely will. We had a fabulous holiday. Thank you, Ashley. The house was everything we had hoped for and more. Great outdoor space which is a brilliant place to relax in the evenings with some food and wine. All three bedrooms a great size - and each with an ensuite! Beautiful open plan kitchen and living area (sofa is ridiculously comfortable) if you fancy a night in watching a film. Fully functioning air con is also a massive bonus for those warm summer evenings. Location-wise the house could not be better situated; minutes walk from 2 beaches, a local supermarket, bars and restaurants, and if you are up a bit earlier, an amazing fresh food market. All in all, we could not have asked for a better place to spend our week in the south of France. Will certainly be returning! Super schönes und gepflegtes Ferienhaus und nur wenige Minuten vom Strand entfernt. Die Lage in einer Seitenstraße in der Altstadt ist hervorragend, nahe am Geschehen und trotzdem ruhig. Supermarkt, Geschäfte, Bäcker, Restaurant, Hafen, Bootsverleih - alles in unmittelbarere Nähe. Das Ferienhaus ist sehr gut ausgestattet. Jedes Schlafzimmer hat ein eigenes Badezimmer. Erfreut haben wir uns jeden Abend an der Eiswürfelmaschine. Einfach genial bei warmen Sommertagen. Wir haben uns sehr wohlgefühlt und hatten einen super Urlaub! Wir können das Ferienhaus bedenkenlos weiterempfehlen! Just back from an amazing stay in the very centre of Antibe. The house was immaculate and had everything we needed to shop and dine at home on the fabulous produce from the market, yet also step out first thing and enjoy the best coffee and croissant in seconds. We can't recommend this enough, perfect! Antibes lies on the Cote d'Azur between Nice and Cannes and is about 25 minutes from Nice International Airport. It is home to Europe's biggest yachting marina. The price quoted is the total you pay including cleaning and laundry. Longer lets in the low season are negotiable. Changeover day is negotiable except in July and August when it is Saturday. Half the rent is payable at booking and the rest a month prior to departure. A €300 euro deposit is payable with the second payment and will be refunded after the guest has left assuming nothing is damaged. If guests cancel there will be no refund unless we manage to relet the property for the period.